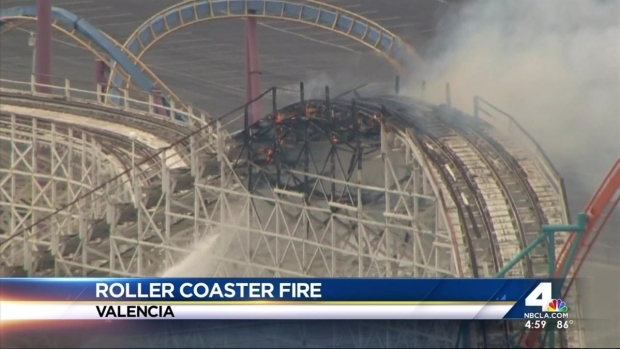 A portion of Six Flags Magic Mountain's wooden Colossus coaster collapsed Monday when the iconic decades-old ride caught fire at the theme park north of Los Angeles. The fire, possibly sparked by a welder's torch, was reported at about 1:30 p.m. By 2 p.m., the fire appeared to have been extinguished. Smoke could be seen from the nearby 5 Freeway. The park was closed Monday, and no injuries were reported, park officials said. The fire started while work was being done to disassemble the venerable ride in preparation for a major overhaul, park officials said. Colossus had closed in mid-August after celebrating with free rides for a final few hundred riders before crews began adding steel segments to create a "hybrid" coaster, set to open in 2015. Retired and under construction, famed Colossus roller coaster at Six Flags Magic Mountain started on fire Monday afternoon. Ted Chen reports for NBC4 News at 5 p.m. from Valencia Monday, Sept. 8, 2014. Work is scheduled to continue after the collapse and fire. Colossus was the world's fastest and tallest wooden roller coaster when it opened in June 1978, and the first to feature two drops that are more than 100-feet steep. "During its reign, it was one of the world’s largest wooden roller coasters, taking up over ten acres of land with more than 4,325 feet of track," according to Magic Mountain's website. In the 1983 movie "National Lampoon's Vacation," the coaster was the grail Chevy Chase's Griswold family quested for in their trip to the fictional amusement park Wally World. Twitter user Tony Slauson tweeted -- "That's one way to get colossus down"